teaching digital kids – Media! Tech! Parenting! Click to read the Washington Post article. After spending years teaching digital citizenship and civility in the K-12 world, I’ve now come to the conclusion that we parents and teachers should, in the midst of teaching children, stress that there is never privacy online. Yes, I know that we already teach this — or try to — in most schools and homes, but election 2016, accompanied by the theft and sharing of emails and other connected world materials, is scary. It has proven that everyone can be hurt by what they say online — even when what is said is not intended to generate hurtfulness. To learn much more about the lack of privacy in private communication read Deborah Tannen’s October 28, 2016 Washington Post column, Why What You Say In Private Looks Bad in Public, Even if It Isn’t. Tannen is a professor at Georgetown University and the author of the bestseller, You Just Don’t Understand. Our confidential comments may differ from what we say in public. When our candid thoughts become widely available — yes, through hacking, but with kids, it’s through intentional sharing, gossip, or the unintentional mistakes that kids make — words can often be interpreted negatively. Moreover, at least for the time being, we live in a world where stealing a public figure’s private communications and making them public appears to be OK. So What Happens to Social Media Data? Read the Terms of Service! I am preparing to make a presentation to a group of well-informed teens at a school. In the process, I’ve reread the terms of service at a range of social media sites to remind myself about what can potentially happen to the pictures, comments, videos, and other content that we share on social media. Social media is a part of life in today’s 21st Century world. Rather than wringing our hands about these apps, and the things that can go wrong, it’s a far better strategy for adults to proactively learn about social media, know what their digital children are using, and help them understand the power of social media apps. Moreover, every social media user — young and old — needs to develop strategies to use when things have the potential to go wrong. 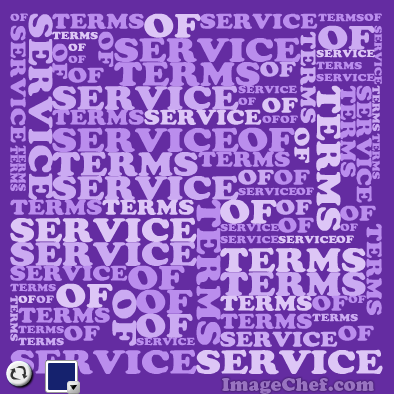 Check out the terms of service for your favorite social media site. What do you think these policies mean for the pre-adolescents or teens in your life? The social media companies design these statements — albeit long documents — to make it clear what happens and what does not. What can you do to ensure that your child develops the necessary tools and strategies to think carefully about what content to post and share and what content to avoid sharing? Ongoing conversations about living in the digital world are a critical part of family life. Each of the clips is from one of the social media websites, and I’ve added a link to each site’s complete terms of service document. Most of the companies want us to understand these documents.